Pierre Moscovici, the European commissioner for economic affairs, warns Debt Talks on Hold Until Greece Agrees Reforms. Greece’s eurozone creditors will not discuss how to get the country’s sovereign debt back on a sustainable path until Athens agrees to a new economic reform programme that would release €7.2bn in desperately needed bailout funds, the EU’s economic chief said on Tuesday. Pierre Moscovici, the European commissioner for economic affairs, said debt issues “can only be discussed after we have agreed a reform programme”. His statement reflects resistance in eurozone capitals to any form of “haircut” on Greek sovereign debt, which is now mostly held by EU governments and institutions. Without a return to sustainable debt levels — or a larger bailout from the eurozone to ensure Athens can continue to pay its bills — the IMF may be forced under its rules to withhold its share of the current bailout tranche, which amounts to about half of the €7.2bn being negotiated. Under a November 2012 agreement between Athens and its international creditors, Greece is scheduled to cut its debt levels to 120 per cent of gross domestic product by 2020 and “substantially lower” than 110 per cent by 2022. Debt relief was agreed as a possible way to reach the targets if Greece was able to run a primary budget surplus. In February, Brussels forecast Greek debt would fall from 176.2 per cent of GDP in 2014 to 170.2 per cent this year; the new forecasts predict it will rise to 180.2 per cent this year. Greece is so far off course on its €172bn bailout programme that it faces losing vital International Monetary Fund support unless European lenders write off significant amounts of its sovereign debt, the fund has warned Athens’ eurozone creditors. The warning, delivered to eurozone finance ministers by Poul Thomsen, head of the IMF’s European department, raises the prospect that it may hold back its portion of a €7.2bn tranche of bailout aid that Greece is desperately attempting to secure to avoid bankruptcy. Half of the €7.2bn, which is the subject of intense negotiations between Athens and its creditors in Brussels-based talks that resumed on Monday, is due to come from the IMF. 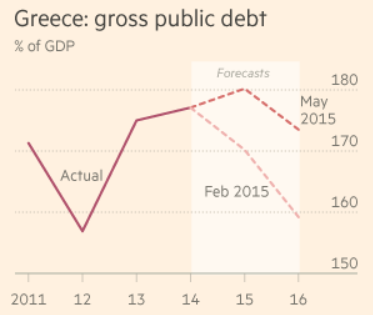 Without the funds, Greece is expected to run out of cash this month. Eurozone creditors, who hold the vast bulk of Greek debt, are adamantly opposed to debt relief. But IMF support is crucial both for its funds and to sustain political backing for the Greece bailout, particularly in Germany. According to two officials present at a contentious meeting of eurozone finance ministers in Riga last month, Mr Thomsen said initial data the IMF had received from Greek authorities showed Athens was on track to run a primary budget deficit of as much as 1.5 per cent of gross domestic product this year. Under existing bailout targets, Athens was supposed to run a primary surplus — government receipts net of spending, excluding interest payments on sovereign debt — of 3 per cent of GDP in 2015. A stand-off between the IMF and eurozone creditors over Greece is not unprecedented. Three years ago, the IMF refused to disburse its portion of the aid tranche because of similar fears Greek debt was not falling fast enough. The IMF only signed off after eurozone ministers agreed to consider, but never implemented, writing down their bailout loans to reduce Greece’s debt to “substantially lower” than 110 per cent of GDP by 2022. It currently stands at 176 per cent. The forecast of a rising Greek deficit after achieving a 1.7 per cent surplus last year — and overly optimistic projections of similar surpluses into the future — would also increase the size of a third Greek bailout, which most officials believe is necessary once the €7.2bn left in the current programme is paid out. Senior officials have initially projected a new programme at €30bn-€50bn, but rising deficits could change that calculation. That was a curious title. Before I read the article, I expected the headline to mean IMF takes hard line towards Greece. Having now read the article, the phrase seems more applicable to the creditors. So here we are. The creditors insist no more haircuts, but the IMF will not approve its half of the next bailout tranche without them. Looking ahead, the fact that Greece's primary account surplus vanished means a third bailout program will be larger than previously discussed. And Greece refuses to take another bailout. For further discussion please see Third Greek Bailout? Another €53.8 Billion Needed? Primary Account Surplus Revisited. However big the third bailout was expected to be, it's now larger. I fail to see how this can all be resolved.